I have no idea what the question was, but I know a rick-roll when I see one. This entry was posted in Bad Answers. Bookmark the permalink. 9 Responses to Bad Answers, Cont. 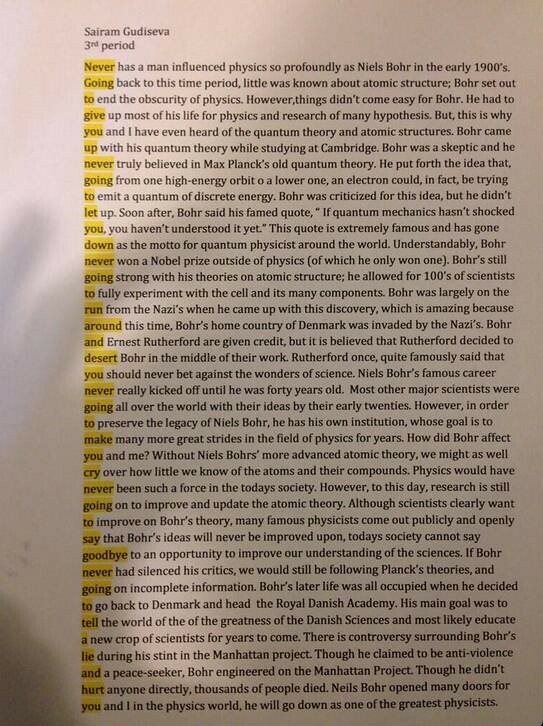 I don’t care what anyone else says – Rick Astley is a LEGEND. I feel like he could solve any crisis we need him to. I’m currently waiting for him to magically make it so that Trump wasn’t elected. I have faith in him, he just doesn’t know it yet. Okay, anything for fun, I always say, but what I really want to know is whatever happened with Niels Bohr? My fellow rhetoric teachers discussed this over some drinks (after school). We agreed that, despite the no-paragraphs-at-all problem, the aimless wandering of the paper becomes aimful when you know its true purpose, form, and audience. Therefore it is a work of quantum rhetoric and receives an A and an F at the same time. I did not know the full breadth of the terms in the Urban Dictionary that are take-offs of Rick-Roll until I clicked on the link. This whole post has been a hoot. Oh, now I see. Those yellow highlights did not show until I looked this morning. Before that, I read the whole damned non-paragraphed rambling text and had no idea what it, or this post, was talking about!